WASHINGTON—Late last week, the Ninth Circuit Court of Appeals denied the Food and Drug Administration’s (FDA) attempt to hide thousands of pages of key government documents revealing how the agency arrived at its controversial approval of the first-ever genetically engineered (GE) animal for human consumption, a GE salmon. The court order rejected the Trump Administration’s position that it can unilaterally decide which documents to provide and which to withhold from public and court review. A broad coalition of commercial and recreational fisheries interests, environmentalists, and tribes challenged the GE salmon approval in 2016. Although FDA considered the application for the GE salmon for nearly two decades, the agency’s record for court review was paltry, including mostly documents already publicly available on their website and only four agency emails. FDA refused to provide thousands of critical documents about how and why it approved the GE salmon. The plaintiffs demanded that FDA provide all of the documents the agency considered in its decision and last January, the lower court agreed. Several months later, FDA sought to overturn that decision by seeking a writ of mandamus from the appeals court, an extraordinary mechanism that is hardly ever used for routine document disputes. In its mandamus petition, the Trump Administration raised a dangerous argument, with severe ramifications for effective court review of government actions—that defendant agencies can determine unilaterally what information to give to courts reviewing their decisions, and do not have to disclose any internal materials, even if the agency considered those materials in its decision. If adopted, this view would have far-reaching consequences for public review of agency decisions that have major impacts on everyday life. Last summer, the plaintiffs opposed FDA’s appeal, as did two dozen law professors who are experts on administrative and environmental law. On Friday, the Ninth Circuit agreed, issuing a short order denying the appeal. 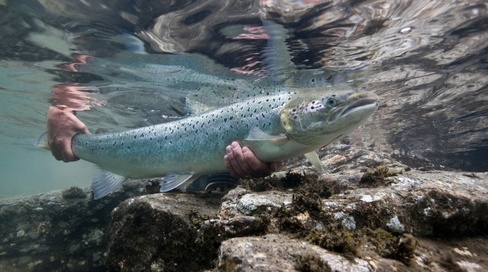 FDA will now have to produce the rest of the GE salmon documents. The case is Institute for Fisheries Resources v. Burwell, Case No. 3:16-cv-01574-VC. CFS and Earthjustice are co-counseling the case on behalf of the following organizations: Institute for Fisheries Resources, Pacific Coast Federation of Fishermen’s Associations, Golden Gate Salmon Association, Kennebec Reborn, Friends of Merrymeeting Bay, Cascadia Wildlands, Ecology Action Center, Friends of the Earth, Center for Biological Diversity, Food and Water Watch, the Quinault Indian Nation, and the Center for Food Safety. Read the full article centerforfoodsafety.org.